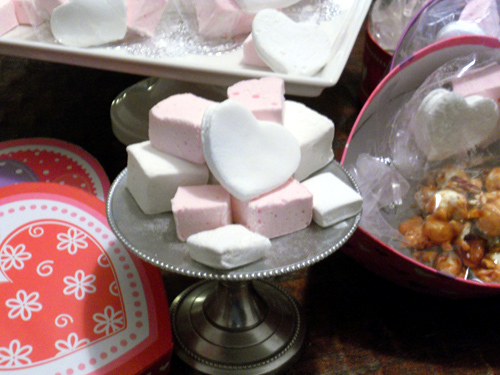 I’ve always been drawn to the idea of homemade marshmallows. I was curious about the construction and exactly what they were made of. Doing a little research – sugar, corn syrup, gelatin – got it. Doing a little shopping – sugar, corn syrup, gelatin options – confused. How to make mine look as good as Martha’s or Ina’s – what brands do they use? There is obvious hidden technique in the off camera shots and descriptions online or in book. Which I think can be discouraging to many beginning cooks. So here I am attempting to share a few of the things I discovered. A pizza cutter saved my life. I found this tool much easier to rip through the terrain with precise and clean lines. Lather. Rinse. Repeat. Competing gelatin texture. Local big box store had two brands. I field tested both – don’t understand the differences but Knox wins by a long shot for the desired texture. Homemade respond just as well, if not better, in other recipes. We dropped them in our mocha, made smores, chocolate dipped them and toasted them directly over open flame – it was a good week in our house. Humidity (Rain) effects drying time. The wetter the day the longer drying time is required. I made the first batch on a raining day. It took 12 hours for them to set up properly. Last batches on warm day, 3 hours. Hot towel makes clean up a snap. In a move to come up with a way to clean my mixer efficiently, I tossed a damp dish towel into the microwave for 60 seconds. Viola! Mallow begone! 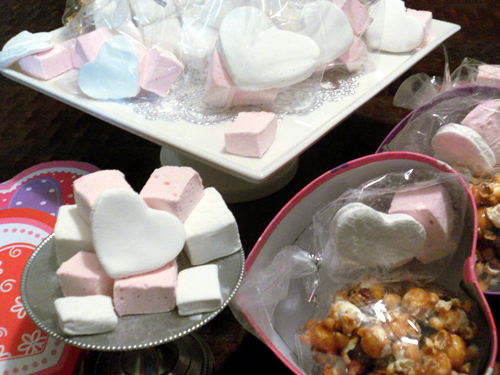 Marshmallow: one batch yielded about 75 one inch cubes not counting the throw away (into our mouths) end pieces. In mix bowl, pour contents of gelatin and 1/2 cup cold water. Stir with spatula until dissolved. Let stand while you prep syrup. Meanwhile back at the stove, add all other ingredients (but not vanilla) into pan. On high, bring to 240 degrees F. Remove from heat. 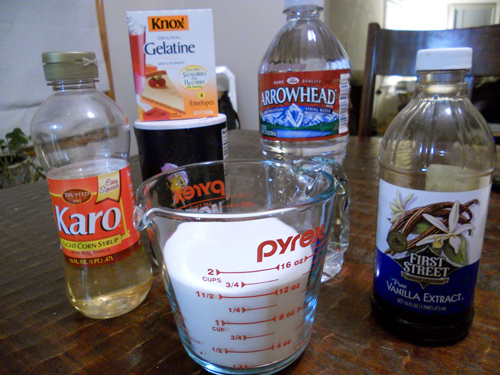 Set mixer to “Stir” and slowly pour all the syrup into gelatin. Set to high-speed for about 10 minutes. Hint, adjust time if it gets too tacky. You want a fluffy whipped pourable consistency. Last 30 seconds in mixer, add vanilla extract. While that fluffs up, lightly grease your casserole dish and line with parchment paper. Dust with powdered sugar. A very important step. Bears repeating – dust with powdered sugar. Ding! Here is where grace flys out the window. Scrape and pull and get as much as you can from the mix bowl into your prepared dish. Spread out evenly and use wet hands to smooth top. Dust with powdered sugar. Let dry on counter top for 3 hours, the paper should peel back from marshmallow. 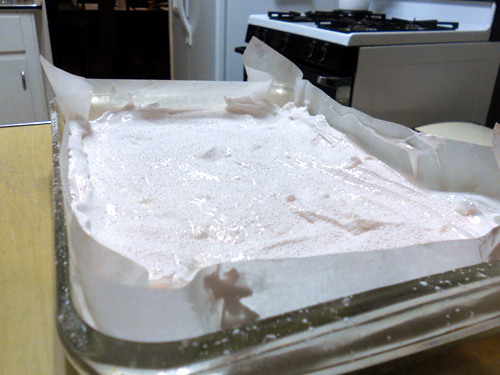 Invert on cutting board and cut up, dusting with powdered sugar to keep from sticking. For a variation, I substituted the vanilla extract for peppermint extract (only 20 drops). 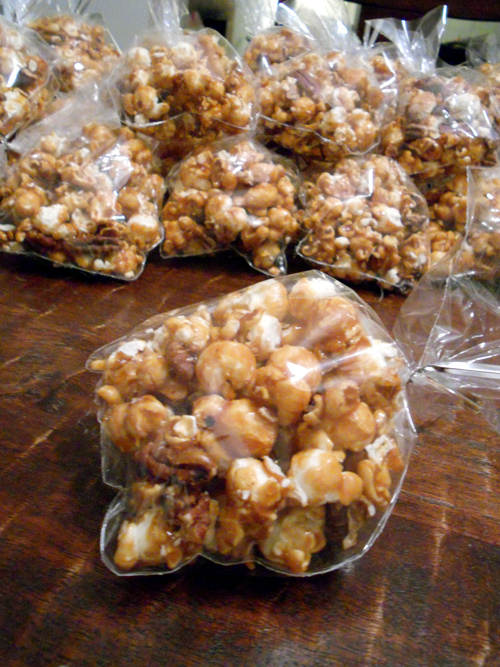 Maple Pecan Popcorn: yielded 13 cups – odd shapes, not bad math. Pop popcorn and let cool. Use 10 best cups of popped corn. I like to pour all popcorn into paper bag, shake gently to make whole pieces rise to the top and lightly skim with my hand into measuring cup. Best to use cooled popcorn or you risk steaming and wilting the freshness out to create a stale taste when you pour the hot syrup on. Melt butter in 2 quart (minimum) pot over medium heat. Add remaining ingredients (but not vanilla) to melted butter and stir to mix. 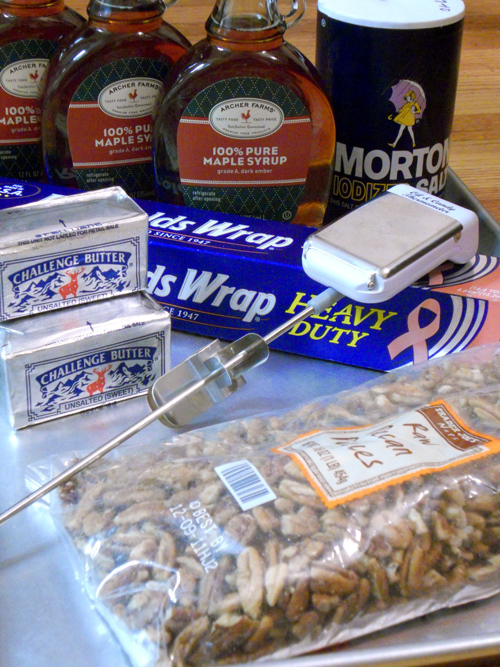 Set the candy thermometer and leave untouched to cook to 300 degrees F (Hard Crack). It took me about 20 minutes. In the meantime, lightly grease your cookie sheet and wooden spoon with butter. Once syrup has reached desired temperature, remove from heat. This is when I like to stir in the vanilla extract (you may omit) but I think it punches up the flavor a bit. Pour entire mixture onto popcorn while constantly moving the syrup back and forth, round and round trying to coat the pop corn and not the large metal bowl. Immediately use coated wooden spoon to toss and spread syrup evenly over all the popcorn. 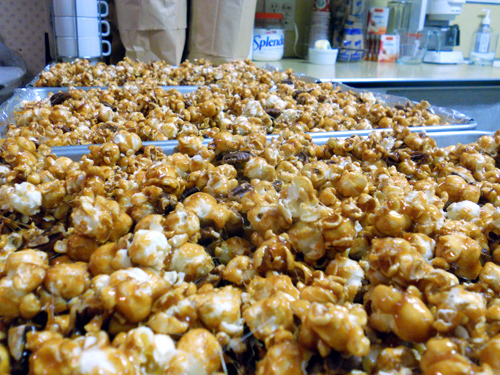 Pour coated popcorn onto greased cookie sheet and spread out evenly as possible with buttered spoon. Let completely cool. After its completely cool (Safety first – that’s why I mention it twice), with hands, separate and crack into bite size pieces. 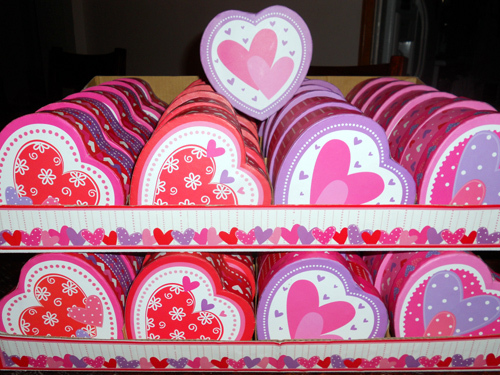 Packed into air tight container or bag, it can easily last for a week. If you are so inclined, at the last moment, you can add small marshmallows (wink wink) or even drizzle with melted chocolate after placing on cookie sheet to cool. Gallery | This entry was posted in Candy, Cook. Bookmark the permalink. Well done!!!!! Can’t wait to read future posts. I like the blog! Very nice! The marshmellows are absolutely delish! “Someone” made them for me once. Thanks for sharing the recipe!